A short story accepted for the The Best Asian Speculative Fiction Anthology by Kitaab, and why I’m chuffed. I had written a few spooky stories which I’d sent out a long while ago. It all rubberballed right back to me, with kind words of rejection from some of the leading publishing houses in India. A noted literary magazine in India first mailed back saying they loved this one I’d sent them on being requested to send them a story and would be carrying it and then went all ghostly silence on me. It made me wonder, was it really that terrible a story? But the story haunted me, compelled me to keep thinking about where I could send it. When I saw the call for submissions for the proposed anthology, The Best Asian Speculative Fiction by Singapore based Kitaab.org, I sent this story out on a whim and a prayer. Rajat Chaudhari, for those who might not be familiar with his work, is the author of three works of fiction – Hotel Calcutta, Amber Dusk and a collection of stories in Bengali titled Calculus. He has been a Charles Wallace Creative Writing Fellow at the University of Chichester, United Kingdom, a Hawthornden Castle Fellow, Scotland, a Korean Arts Council-InKo Fellow resident at Toji Cultural Centre, South Korea and a Sangam House India resident writer. This year, he was a judge for the short story segment of Asian English Olympics organised by BINUS university, Indonesia. Kitaab.org was founded in 2005 by journalist and writer Zafar Anjum in Singapore as a space to celebrate and critique Asian writing in English. Headquartered in Singapore, Kitaab provides a writing and publishing platform to emerging and seasoned writers from the region to express themselves creatively. The reason for this long post? You might have setbacks, but believe in your work and your writing. Keep sending it out into the universe. If you’ve written from the heart, the world will make space for it on its bookshelves. The anthology should be out next year. Women Writers’ Fest, the travelling literature jamboree that debuted last year, with editions in Delhi, Kolkata, Bengaluru and Pune, aside from Mumbai, returned to the city this weekend. While the first day took place at the Bandra bookstore, Title Waves, today’s sessions will be taking place in Kala Ghoda. The festival is being organised by SheThePeople TV, the feminist video storytelling platform. Why a feminist literature festival? Kiran Manral, author, columnist and speaker, ideas editor of SheThePeople and co-curator, with founder Shaili Chopra, of the festival says, “For most of history, Virginia Woolf said, Anonymous was a woman.” It wasn’t that long ago, she reminds us, that women weren’t allowed to have an education, so, “The fact that we’re writing now, and have a voice, is something we should take full advantage of.” The festival, then, is about giving women writers a space to discuss issues not given prominence at other festivals, but which are central to and inform their work. I must confess, anchoring Bombaywaali has been a most inspiring journey for me. With every speaker, there is something to learn, takeaways that jolt your brain and make you think and enthuse you to keep following your dream. This month’s Bombaywaali by Shethepeople.tv had me chatting with the only Master of Wine we have in India, one of only 369 people in the world, Sonal Holland. Sonal’s is an unconventional journey. She began in the corporate world, and shifted to making wine her life mission on an impulse. And that she’s reached so very far in this journey is not just commendable but an inspiration to every single woman who has ever toyed with the idea of reinventing herself mid-career. And more than everything else, she’s warm, she’s real and she’s got a fierce work ethic. Build your tribe. Ask for help. And take all the help you can get. An idea is only yours when you act on it. Until then it is floating around in the universe for anyone to grab it. Make your work your life’s mission. After every great failure is great success, but only if you have the courage to keep going on. Mommy guilt is real and terrible, but you need to deal with it and get on. And here are some pictures from the event. 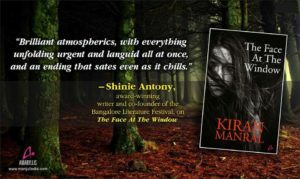 Kiran Manral weaves a web of intrigue, conjures up an atmosphere of dread and brings to life characters who will haunt us long after we read the last page. One of the most prolific writers in India, Kiran Manral moves between genres and stories smoothly and seamlessly just like the ghost of the Windermere cottage in her book, ‘The Face at the Window’. Not many Indian authors write horror, and this is what intrigued me to pick up this one. A few pages into the story, I realized this wasn’t another one of those cliché horrors that make one roll their eyes and yawn from boredom. Kiran Manral weaves a web of intrigue, conjures up an atmosphere of dread and brings to life characters who will haunt us long after we read the last page. After reading 100+ books every year for the last few years, I have realized that what I look for in every novel that I read is a good story. Don’t get me wrong—I love language; it is what I breathe, caress, memorize, underline and write down in my journal, but it all vaporizes in the absence of a good story. Opinions differ, and I know many readers who can sacrifice the pleasure of a good story just to be enchanted in the arms of beautiful prose. That’s not me! However, if you give me a book that has a unique plot narrated by a master storyteller in the most delightful language, you turn me into a fan of the author. That’s exactly what I found in ‘The Face at the Window’—a grasping tale told in stunning prose. Thanks Smita Singh for the kind words. Bookaholicanonymous is delighted to present this exclusive interview with Kiran Manral. She is a prolific writer, writing books across genres. Her book ‘Saving Maya’ which was earlier launched on an app, is all set to be published in print by Bombaykala any day now. She is someone I admire and would love to accomplish half of what she has achieved till now. Kiran Manral published her first book, The Reluctant Detective in 2011. Since then, she has published seven books across genres till date. Her short stories have been published on Juggernaut, in magazines like Verve and Cosmopolitan, and have been part of anthologies like Chicken Soup for the Soul, Have a Safe Journey (2017) and Boo (2017). Her articles and columns have appeared in the Times of India, Tehelka, DNA, Yowoto, Shethepeople, TheDailyO, Scroll, Buzzfeed, New Woman, Femina, Verve, Elle, Cosmopolitan, Conde Nast Traveller, DB Post, The Telegraph, the Asian Age, iDiva, People, Sakal Times, and more. She was shortlisted for the Femina Women Awards 2017 for Literary Contribution. She is a TEDx speaker and a mentor with Vital Voices Global Mentoring Walk 2017. Phew! Is there anything she hasn’t done? Thanks for the kind words Archana Sarat. Kiran Manral is a renowned Indian author, TEDx Speaker, columnist, mentor and feminist. She has written books across genres in both fiction and nonfiction. 1) What would be one thing you wish you could undo in your writing career? Nothing actually. Everything has happened when it did for a purpose. And I’m glad it did. 2) The first thing that struck me when I read ‘The Face at the Window’ was the beauty of your language. It was evident that it was penned by someone with a love for words. So, when did that develop? Did you take any conscious efforts in becoming a wordsmith? The only thing is the love of reading. One reads and one loves language. Well, I never had a plan. I just wrote. My first job in advertising came about quite by default. My then boyfriend now husband was working in sales at a white goods company. He’d visited one advertising agency and in the course of casual conversation, it cropped up that they were looking for copywriters. I went across the next day and landed the job. I quite hated advertising, I must be honest. I was there for a year or so I think, and then moved into journalism. Journalism was my career for the longest while, and then came motherhood and I took a break from a regular job, going freelance. So it has just been a series of default options that happened as life happened to me. But I’m glad I went freelance, because I then discovered blogs where I could write what I wanted to write and through those blogs, I found a readership who became my biggest cheerleaders when I finally bit the bullet and wrote my first book.